No matter what the type of genetic screening, certain core principles should be followed before a program is introduced. • The condition sought should be an important health problem. • There should be an accepted treatment for patients with recognized disease. • Facilities for diagnosis and treatment should be available. • There should be a recognizable latent or early symptomatic stage. • There should be a suitable test or examination. • The test should be acceptable to the population. • The natural history of the condition, including development from latent to declared disease, should be adequately understood. • There should be an agreed policy on whom to treat as patients. • The cost of case finding (including diagnosis and treatment of patients diagnosed) should be economically balanced in relation to possible expenditure on medical care as a whole. • Case finding should be a continuing process and not a “once and for all” project. 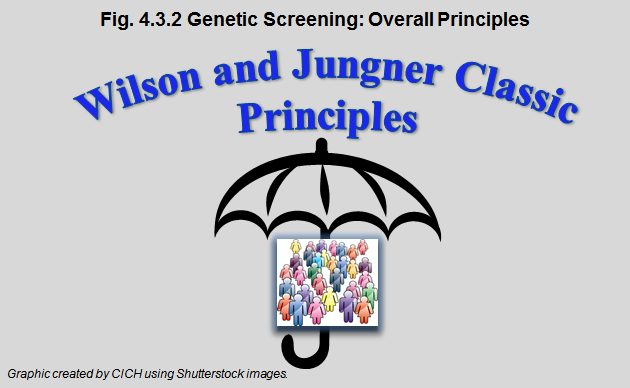 Source: Wilson JMG, Jungner G. Principles and practice of screening for disease. Geneva: World Health Organization; 1968. In justifying population screening, it is important to provide benefits to the people who will be screened. Benefits require that screening be monitored and that appropriate clinical follow-up is provided based on the screening results. Early access to treatment and support greatly enhances alleviation of disease symptoms, reduces risk factors, and initiates observation measures for further disease signs and symptoms.